This impressive cast iron piece, complete with its original gilding, represents the image of the “thousand-armed, thousand-eyed Avalokitesvara” chonsu kwanum posal. Seated in the oriental posture, the 43-handed entity (each hand with a different attribute) appears to be gently bowing at the feet of a small Amitabha Buddha held over his head by two of his upper arms. Here, the bodhisattva is wearing a princely crown, decorated with fleur-de-lis, derived from an older model already well known at the time of the Kaya kingdom (1st-6th century CE). The large face with its rather narrow forehead reappears on stone statues of typical 10th-11th century workmanship. This particular Avalokitesvara iconography came directly from the repertoire of Tang dynasty China (618-907 CE) like those featured in the decorative wall paintings in the Dunhuang caves. 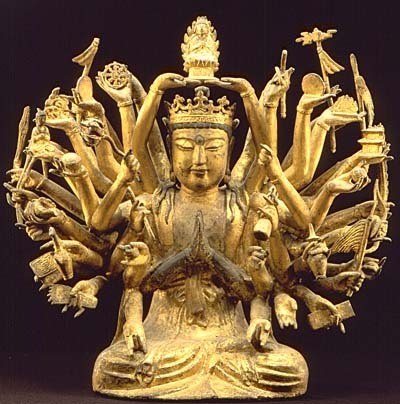 Avalokitesvara was in fact the representative bodhissattva of the “Buddha of Light”, the “Buddha of Infinite Life”, in the paradise into which all hope to be reborn. He interceded on behalf of this Buddha, who enjoyed increasing popularity at a period that lay under the shadow of the Mongol threat. According to the calligraphy inscription on the wooden plinth, the statue came from the temple of Tongbang-sa, founded at the time of the Unified Silla (668-935 CE), and particularly active during the Koryo period (932-1392 CE). It is the only known Korean specimen of a sculpture in the round from such an early date to depict this particular image, although the iconography was already apparently in vogue in China under the Five Dynasties (907-960 CE). The statue is therefore a reminder that esoteric Buddhism, originally characterized by Hindu imagery, subsequently developed along lines that progressed logically from Tang China to Heian Japan (794-1185 CE) via Koryo Korea.